The House History Man: Your Old House Had Dead Bodies In It - Almost Guaranteed. Have an old house in Washington, DC? It’s most likely that you had a dead body resting in it for a few days. I’m not talking homicide here, but a funeral. In your living room. I just finished up a house history for a client near 20th and Belmont Streets, NW that had a total of four funerals that took place inside the house, all within a twenty year time span. I often write that the funeral took place in any given house, but now and then, a client requests that I don’t divulge if a dead body was ever in the house. The problem is, if your house is more than 50 years old, it is most likely that many dead bodies have once been inside; people either died at home or their funeral took place in the living room. As a young child, my mother recalls having to remove the Christmas tree from their living room for her mother’s funeral following her death on Christmas Eve. Today, that scene might require years of therapy, but in the 1930s that was the norm. Most DC residents held their funeral at home, especially before modern funeral homes were licensed beginning in the 1930s. 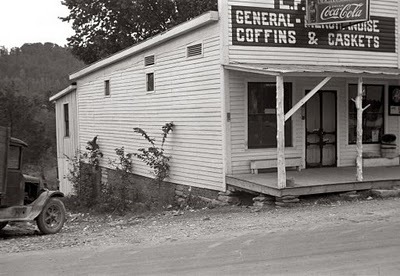 You purchased a coffin made by the local furniture or cabinet maker, death certificate, and obtained a permit to transport a body to the cemetery, and that was the brunt of it. 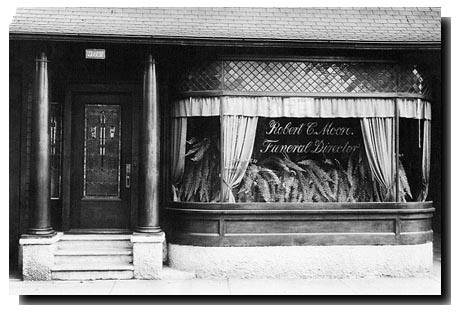 Before embalming became commercially available around the turn of the twentieth century, funerals were obviously held soon after the death. 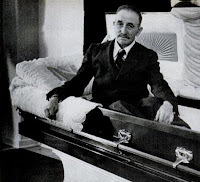 Embalming was first developed and used during the Civil War by Dr. Thomas Holmes who was tasked with preserving the bodies of army officers so that they could be sent home for burial. But localities did not have that need, and it wasn’t until good old capitalism took over that traveling salesmen soon began visiting towns and cities across the nation offering embalming training and techniques, and – you guessed it – supplies for sale. 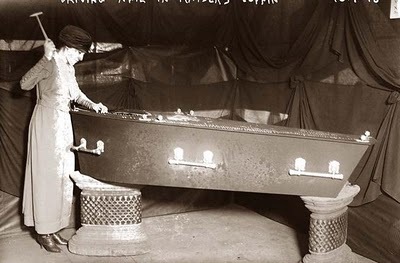 The first embalming solutions were arsenic based but were rapidly replaced with formaldehyde. Over time, the liveryman, who was tasked with transporting the body, became more involved in the overall procedure and event coordination of death, and “undertake” many of the additional duties that began to become custom and tradition following the Victorian period. Funeral and funeral merchandise expansion after the turn of the twentieth led to the term “Undertaker,” and they could be more efficient all in one place – the funeral home – beginning in the 1930s and 1940s. They were often located in former homes turned businesses. Today, you might be surprised that most States only require a certified death certificate, a permit to transport a body, and that the body be buried, cremated, or donated to medical science. No embalming is required, and many relatives are beginning to once again hold funerals in their homes as a cost saving measure. And as long as we are on the topic –I know your dying to know – let’s talk a little about cemeteries themselves. I love exploring cemeteries, but I usually get the “how dare you" look or whispers that it is not respectful. But then I remind them that I’m a historian, and they are about to get a history lesson. Cemeteries designed during the Victorian era in the 1870s (and earlier) were meant to be not only explored, but to be used as parks, where one might spend the entire day, and spread out for lunch or long strolls. They offered a respite from urban centers, high heat, and the smells of animals and smog of burning coal. Cemeteries were outfitted with meandering paths, benches, and meadows where the entire family would gather and gossip. You only need to look at old postcards of cemeteries to see that they were full of people, and not a place to avoid. Some existing cemeteries are now returning to their roots – Congressional Cemetery on Capitol Hill being an excellent example of attracting people to explore its surroundings and grave markers by creating a dog walkers group, volunteers for repairing and cleaning, and even a playful “dead man’s run” to raise funds for the restoration. Interesting indeed: anybody have more information or verification? The truth? Many Victorian homes have niches built into the wall of the staircase. They were for decorative purposes, to display a statue, perhaps a bust, or a vase, or maybe flowers. People usually did die at home, and if the bedroom was upstairs, the body could easily be carried downstairs and placed in a casket. Most books about Victorian architecture try to debunk this myth. John Maass calls it a hoax in The Victorian Home in America (1972). Another fascinating entry Paul. And I had no idea about cemeteries doubling as social venues. I guess it makes sense if you think about it, though. Thanks for sharing! I grew up in Pittsburgh, PA. It was very common for poor ethnics, like my family, in company towns to hold funerals at home. In fact, my grandfather would often tell us -- to our horror -- about how he had to embalm his own father when he was just a boy. He cut an opening in the heel, placed a bucket below his father's foot to catch the fluids, and then inserted another tube somewhere along the neck. I have no idea if he was telling the truth with this procedure, but it left a lasting memory. Great history lesson, what a great topic. Thank you from the team at Davis Funeral Home for this article.